Good news for those Connecticutians who used to enjoy Mark Twain Days in Hartford. Though there won't be a frog jumping contest or fencing expos, there will be some frozen treats at the historic home. 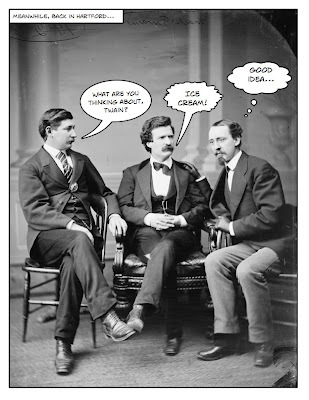 To celebrate the brand new 1890's ice box in the Mark Twain House, the landmark will be having an ice cream social from 4-7 PM on July 30. And the ice cream will be donated by the the UConn Dairy Bar. What could be finer? Lemonade, music, games, and more round out the evening...and be sure to visit the Harriet Beecher Stowe House next door! So tomorrow, join Tom Sawyer and Uncle Tom for some ice cream! Thanks to Korky Vann of the Hartford Courant Blog for the tip.